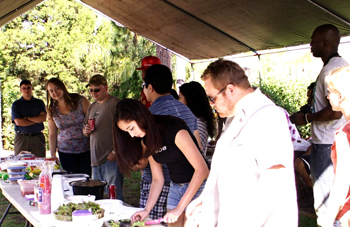 TAMPA, Fla. -- Students from the Ethics of Food Production class gathered under a tent at the USF Botanical Gardens to gorge themselves on organic produce and vegan meals. This potluck, held on April 14, was a result of a semester-long process of maintaining their own vegetable garden where they finally got a chance to enjoy the harvest. Sara Dykins Callahan, visiting instructor in the Department of Humanities and Cultural Studies, taught this course as a pilot program. She said she wanted this course to help students become aware of where their food comes from. Because it was an ethics course, she said they looked at labor and how to make decisions based on what is right and wrong. Throughout the semester, the students have learned about industrial farming, also known as agribusiness. Callahan said this is where toxic environments have been created, not only for the animals and the workers of the industry, but also for the people who eat the products of that industry. So, to help the students learn how to take responsibility of what they put in their bodies, she had them maintain a garden plot at the USF Botanical Gardens. “They started from seedlings, raised them and now have a harvest of lettuce and arugula,” Callahan said. She said they still have some tomatoes and broccoli to harvest as well. In addition to this, the students have learned how to cook vegan meals and presented these preparations to the class. Callahan said many are making significant changes in their eating and purchasing habits, such as finding out where their meat comes from. Callahan said she is glad students are making informed decisions now, which was the goal. Rene Zapata, a student in the course, said he has found himself questioning the things he used to think were healthy. Coming from his home in Panama, Zapata said the food there is handled differently from here in the U.S.
Student Rebecca Cogan said the class has impacted her in that she does not eat meat as much as she used to. She said she also checks to see if food is genetically modified. When the class went on a field trip to Sweetwater Organic Farm earlier in the semester, they learned how to grow produce organically using cow manure. From this, Cogan said she decided to start her own garden at home using this natural fertilization process. “My garden grows great!” Cogan said.